I have decided to move couple of our sites to Hyper-V. One of questions that came to mind was which backup to use. 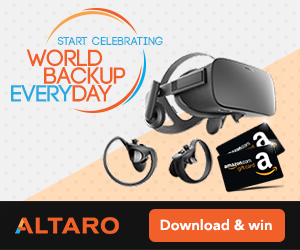 There are a lot of choices for backup products but one name keeps coming up – Altaro. They provide a great backup for Hyper-V so I decided to write a review. Now at version 4, product evolved a lot from that last time I noticed it. GUI looks great and feature list is amazing. Is it any good? Let’s find out. 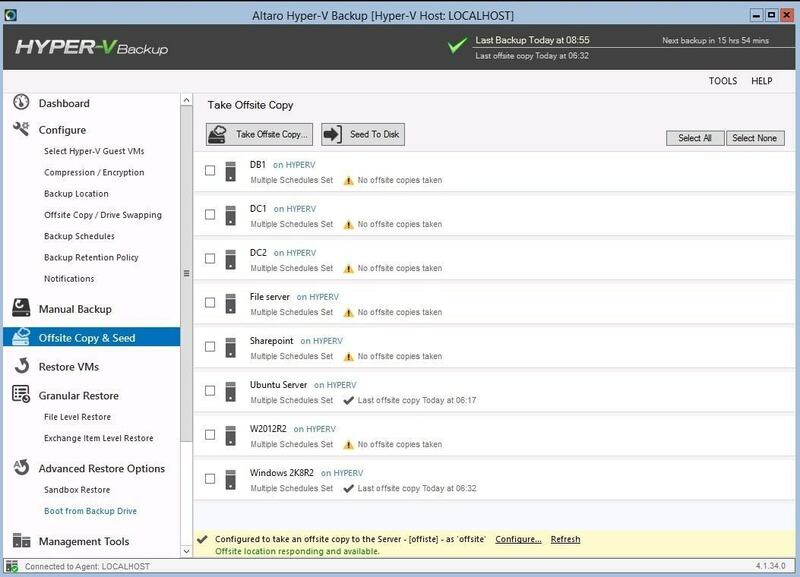 Altaro Hyper-V backup has a dashboard which shows you the most important data. You see information about backup repository, backup activity and backup size growth. It’s great to easily see a backup state. You have information about backup, offsite backups, and restores. 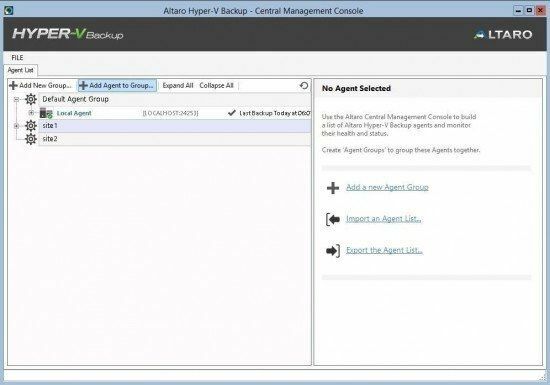 What I really like about Altaro Hyper-V backup is its sleek interface, it’s designed with usability in mind, the interface guides you to set up backups in the most easy and efficient way. You won’t be looking at various menus and jumping from one option to another just to find the way to correctly configure backups. Menus on the left are designed in a way that you follow them and set up a backup in the least time with all the options you need. First you have to select all the servers. Then you save the selection and proceed to the next step. For backup location you can choose a drive which can be a local drive, USB drive, ISCSI drive or you can choose a network drive. What makes Altaro Hyper-V backup stand out is Offsite configuration, it’s so easy to set up that you won’t have to read a manual, all the options are presented graphically. 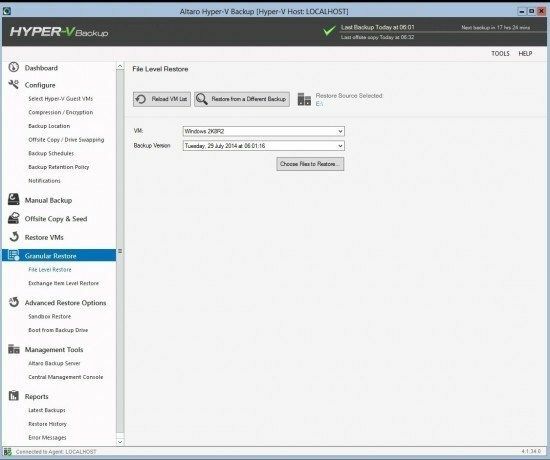 You have an option to backup to another Altaro Hyper-V backup server, network or you can set up rotation with USB drives. Offsite copy uses WAN acceleration so that transfer is faster. Configuration for USB drive supports drive swapping and you can add network share as well. 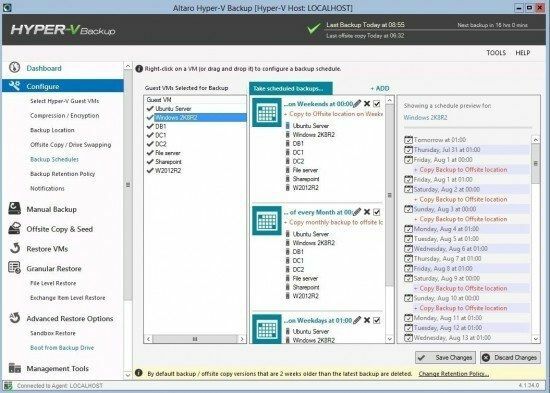 Backup schedule deserves a mention, on the left side you have a list of the servers which you can select and set a schedule. What’s impressive is the layout of the schedule. You can easily see when and what will be backed up. It’s also one of the most easy and most transparent implementation I have ever seen. 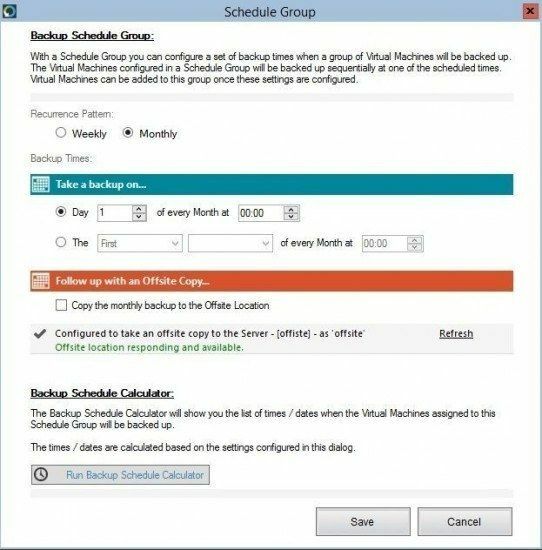 Backup schedule has an option to back upon on the first day of the month. That’s great as there are still backup solutions that don’t have this option. On the same schedule screen you can also configure offsite copy as part of the schedule. Maybe you only want weekly or monthly backup to be on offsite location. You can configure offsite copy for every schedule group. Once the schedule is configured, you can view retention policy for each server. If required you can change retention per server and add it’s own requirement. For example, if a database is the most important asset, you would want to have the database data available for several years. Quite opposite, for AD you may not need the same requirements. 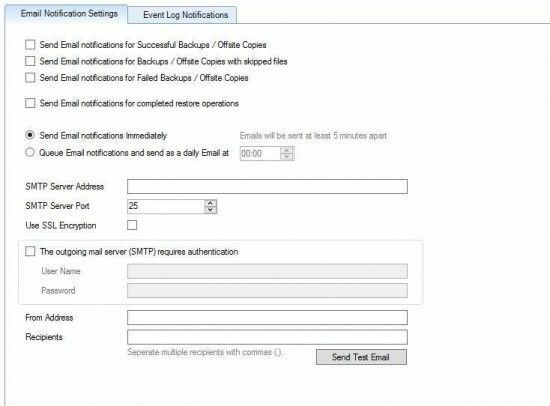 Email Notifications can be configured for successful backups, failed backups or both. Offsite copies can be monitored on the Offsite copy and Seed menu. You can seed a backup first and you can also manually start offsite copy on a Sunday for example when nobody is working. When doing a restore, you can choose to overwrite the original server. But in case you would like a restored VM to run along side the original , you can restore it as a clone and choose that network is disabled. In that case you avoid having IP conflicts. You can select which date of backup to restore from the drop down box. Then just press restore selected VMs and voila, backup restored. Granular Restore has two options, you can restore files and folders or you can restore emails/exchange items granularly. If you need a file from the backup, you will have to select a server and date of the backup. When the file level restore console opens, here you can select folders and files which you would like to restore. The same applies for Exchange. You can restore email items like browsing emails in Outlook and sending them to the desktop. Another restore option is called Sandbox restore. Sandbox is primarily used for testing the backups. 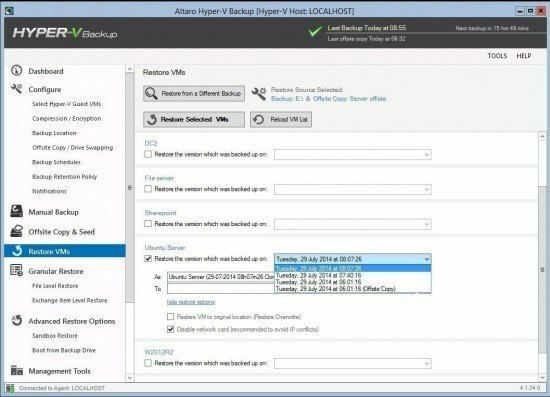 How good is a backup if you don’t know if you are able to restore? Sandbox gives you the power to test backups effortlessly. 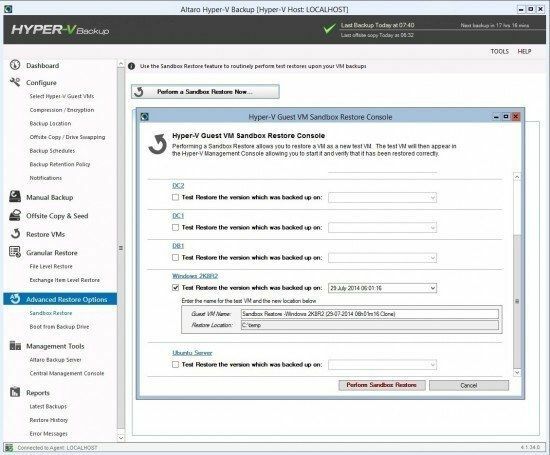 Select servers, backup date and perform Sandbox restore. In this manner you can check they all work. That way you will sleep well as you are sure that you are able to restore back your VMs. 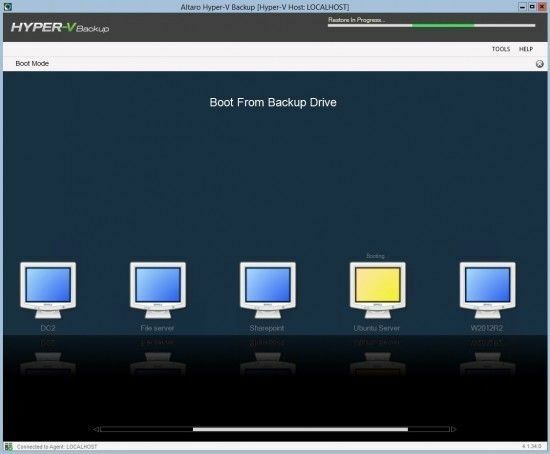 Another innovation in version 4 is called Boot from Backup drive. Let’s say that your server got infected with a virus. You would like to test if a Virus is also present in your last backup. 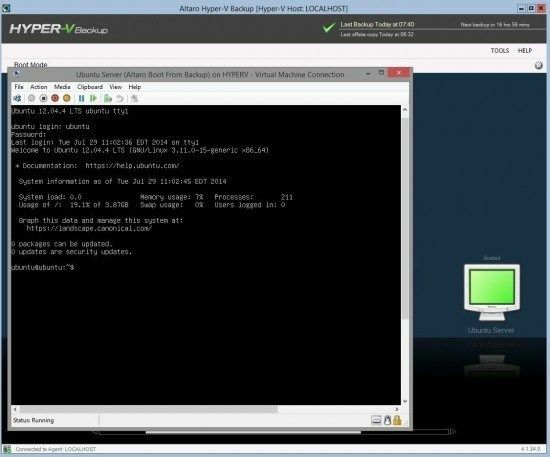 In Hyper-V console you can see Altaro Boot next to the server, in that case you know which one is running from backup. You will run the server directly from the backup, you can review the server to be sure there is no virus. Once you are done you have an option to discard the changes or to save the changes and go live. The last feature is management. You can have many sites but you would like to manage them centrally. With other backup solutions you have to log in to each backup server separately. Altaro has a Central management Console that you can use in such situations. It shows you the backup status, restore status and events for the server. First is called Backup console. It shows you backup status, restore status and events for the server. 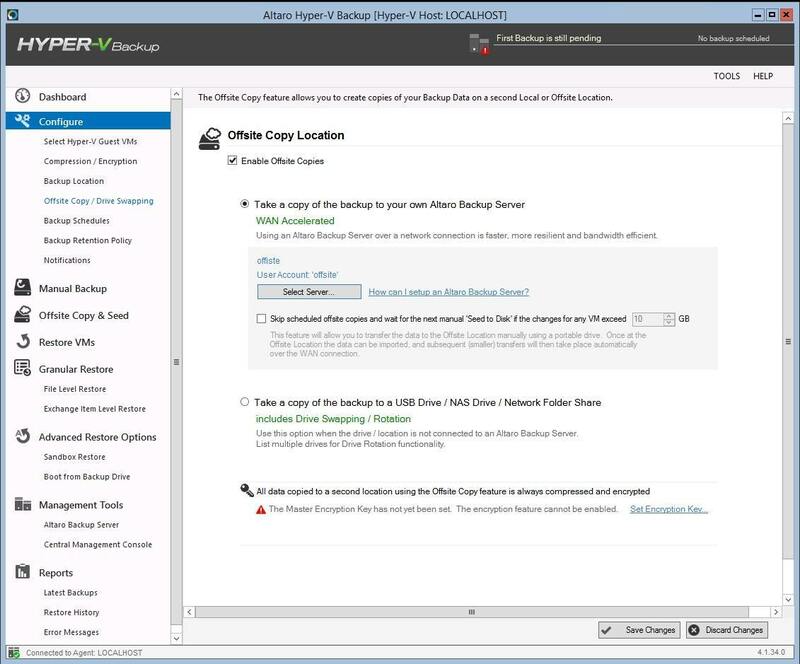 Here you can manage sites, review backup status or you can launch the backup console. 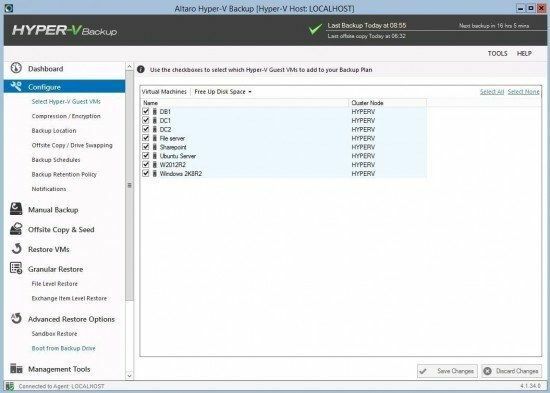 Altaro Hyper-V Backup is the biggest surprise. 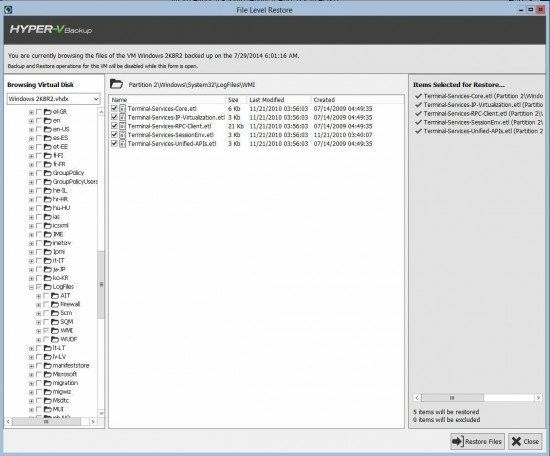 Not only have they created a great and simple to use product but the new features really make it one of the best backup solution for Hyper-V. They have three editions. Standard, Unlimited and a Free Edition. The only difference between the Standard and the Unlimited version is the amount of virtual machines you can back up. Standard edition is limited to 5 virtual machines where the Unlimited edition has no limitation. 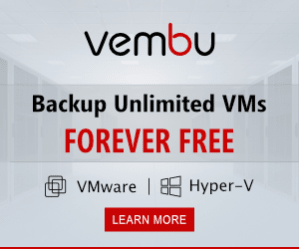 The third edition, is the free version which allows you to back up 2 VM’s for free, forever! Altaro Hyper-V is a rare product where pricing is not calculated per CPU – instead it’s calculated by amount of hosts. If you have 2 servers, each with 4 sockets, you will have to buy 2 licenses. With competition you would have to buy 8 licenses. 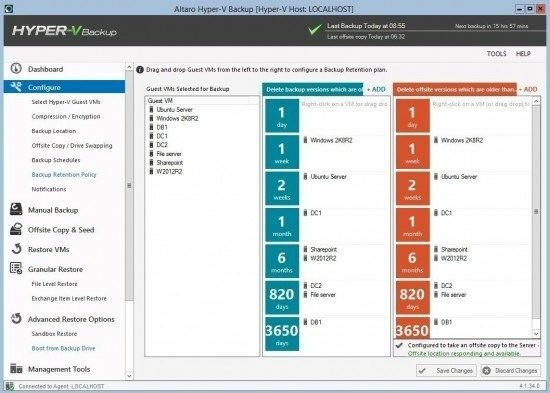 You can download Altaro Hyper-V backup and give it a go, it may surprise you.